The male psyche is such a fragile animal that virtually any questioning of it will result in either an abundance of defensive mechanisms kicking in or a complete melt-down. This is why men need to be right about everything and asking for help on any matter is considered a mortal sin of the ego. That’s why when in the fifth season finale of Seinfeld, when George Costanza decided that all his instincts were wrong and he should do the exact opposite of what he initially thought he should do, and because of his new-found choice of behavior, he got a dream job, a dream girl, and a dream apartment, it was such a wonderfully satirical dig at the male ego. Writer/director Quentin Tarantino should have taken George’s advice. His instinct, especially evident on talk shows, is to talk a million miles a minute, spouting off movie references and trying to sound cool. This shows up in his films as well, so much so, that in his half of Grindhouse, Death Proof, his tribute to badly made 70s car movies, where he indulged himself so much, that he accurately represented what it was like to sit through a cheap, indifferent exploitation movie, where the dialogue is just padding to get to the next car stunt. His two Kill Bill films at least resembled actual attempts at telling a story, amidst all the annoying nods to westerns and virtually every popular Asian B-movie of the last 35 years. Tarantino’s new film, a pseudo-remake of Enzo Castellari’s low budget Italian rip-off of The Dirty Dozen, Inglorious Bastards (intentionally misspelled as Basterds for the modern version, and depending on where you look, he’s spelled it Inglourious as well), has far less of his obnoxious habits of reminding the viewer that they are watching a movie, but there’s still far too much of it. 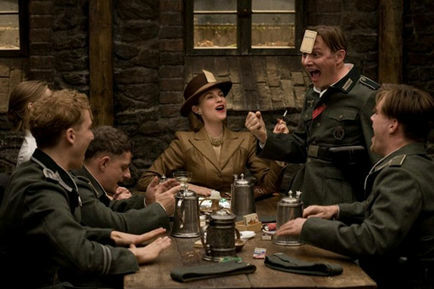 What’s interesting in Inglourious Basterds has absolutely nothing to do with top-billed star Brad Pitt (who is probably on-screen less than 1/3 of the entire film), it’s the tense and nerve-wracking scenes of interrogation by the Nazis, trying to find Jews during the German occupation of France. Playing the “Jew Hunter,” Col. Hans Landa, Christoph Waltz is funny, terrifying and whip-smart. The very first scene, with Landa trying to drag out information from a scared French farmer harboring Jews, is probably the best scene that Tarantino has ever been involved with. It’s not just the sharp, passive-aggressive needling by Landa and the technical expertise involved or Tarantino’s former specialty with witty, original dialogue, it’s that he’s willing to get out of the way and let the material play out on its own. Any time a directorial touch threatens to interfere with the scene, like the initially intrusive and inappropriate musical cues taken from a Sergio Leone western*, or the possible concession to the American market by having foreign characters switch to English, Tarantino tweaks it in an surprising fashion. It isn’t like the scene plays out in an unpredictable manner, you know where it is going pretty quickly (after having a glass of milk and eyeing the farmer’s daughters, Landa insidiously says to the farmer “To your family and your cows, I say Bravo!”), but that’s exactly what makes it so agonizing. This opening fifteen minutes could easily have been its own short film (Tarantino breaks the movie up into chapters, perhaps the best way to avoid segues he didn’t write in). What follows this stunning introduction doesn’t quite live up to it, but Inglourious Basterds has more similar scenes of intrigue and paranoia that pay off as well, including a 45 minute scene in the basement of a bar. Tarantino’s willingness to slowly develop the sequence is what makes it work; a filmmaker with his eye on the box office would have eliminated this section without harming the elements of the plot. These quiet moments are what he does best, the drawn out stoner sequences in Jackie Brown are proof of that. But then Tarantino’s instincts kick in and the movie goes on irony overload, Samuel L. Jackson narrating, Brad Pitt playing his knowing hick character like he was Matthew McConaughey, and Hitler presented as some sort of heel in a Marx Brothers movie. If Tarantino wanted to go in the nudge-nudge direction he should have either fully committed to it, or put it in another movie. The reality and the tension of the Landa scenes of the first half are totally undermined by turning the second half of the 2 ½ hour movie into a silly cartoon. 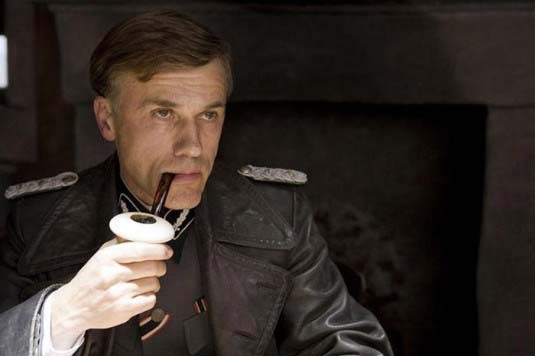 Landa begins to belie the intelligence previously established by making one bone-headed uncharacteristic decision after another which is how we end up with the entire cabinet of the Nazi party at a movie theater being run by an escaped Jew. 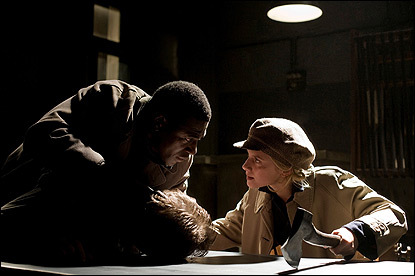 Tarantino’s decision to not really remake Inglourious Basterds resulted in a movie where the title characters are unnecessary, as the final action would have been carried out without their help and nothing would have changed. He gives us a line-up of bad-asses who like to scalp Nazis and tries to squeeze them into an emotionally stirring movie about despair, guilt, and sacrifice. 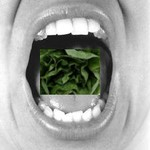 Looks like Tarantino not only needs a gag order on his mouth, but on his brain as well. * Much like Leone made The Good, The Bad, and The Ugly a war movie under the guise of a western, Tarantino has made a western under the guise of a war movie. P.S. For those who like podcasts, I interviewed Benji, the dog, about Inglourious Basterds. You can hear it here. This entry was posted on Thursday, August 20th, 2009 at 11:22 pm	and is filed under Action/Adventure, Thriller, Western. You can follow any responses to this entry through the RSS 2.0 feed. You can leave a response, or trackback from your own site. I would have liked this movie if it had stayed with the Inglourious Basterds, and not have gone off and lost its self in a completly different story. The begining was action packed, funny, and brutal. But in Tarantino style, the dialouge will put you to sleep. And after a while you forget what the movie was even about. The only good thing to say about this movie were the great performances by Pitt and Waltz. Pitt was barley in this movie but his performance was great. Waltz however was undescribly great, which is why he got and oscar for his performance.